The 61A00-1 Wireless Glassbreak Detector is an omni-directional acoustic sensor and wireless transmitter. It is used for detecting the sound of breaking glass, providing 360º of coverage. Get rid of all those wired security transmitters. No more unsightly wiring. Wireless transmitters and receivers clean up the look of your windows, ceilings, hallways and doors, achieving the pleasant and comfortable appearance you desire, while maintaining the security you prefer. 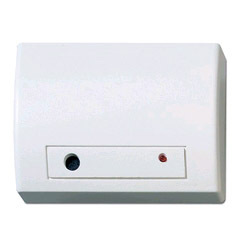 This Glassbreak Window Sensor transmitter requires the use of an HAI 64 Zone Wireless Receiver (HAI Part Number 45A00-1).